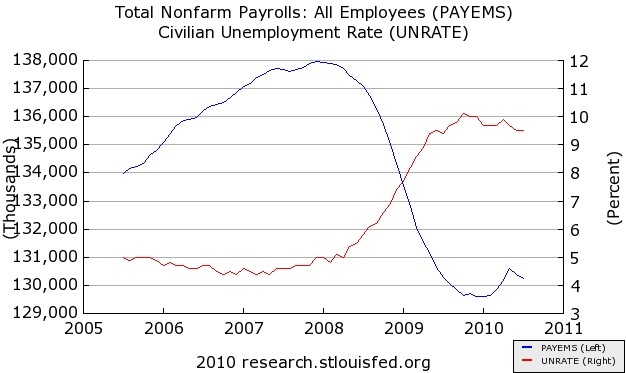 Although output growth should be stronger next year, resource slack and unemployment seem likely to decline only slowly. 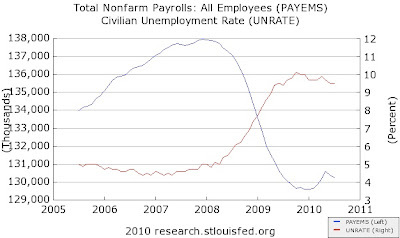 The prospect of high unemployment for a long period of time remains a central concern of policy. Not only does high unemployment, particularly long-term unemployment, impose heavy costs on the unemployed and their families and on society, but it also poses risks to the sustainability of the recovery itself through its effects on households' incomes and confidence. Bernanke methodically weighed several ideas that have been circulating about how the Fed could give the recovery a push (see e.g., Joseph Gagnon and Alan Blinder). [U]nder current circumstances, the effect of reducing the IOER rate on financial conditions in isolation would likely be relatively small... Moreover, such an action could disrupt some key financial markets and institutions. Importantly for the Fed's purposes, a further reduction in very short-term interest rates could lead short-term money markets such as the federal funds market to become much less liquid, as near-zero returns might induce many participants and market-makers to exit. In normal times the Fed relies heavily on a well-functioning federal funds market to implement monetary policy, so we would want to be careful not to do permanent damage to that market. Meanwhile, Senate Republicans have blocked a bill that would funnel more credit to small business through the Treasury. [C]ommitting to keep the policy rate fixed for a specific period carries the risk that market participants may not fully appreciate that any such commitment must ultimately be conditional on how the economy evolves. Indeed, by putting it that way, methinks the chairman makes it harder to make any such future promises credible. I see no support for this option on the FOMC.... [R]aising the inflation objective would likely entail much greater costs than benefits. Inflation would be higher and probably more volatile under such a policy, undermining confidence and the ability of firms and households to make longer-term plans, while squandering the Fed's hard-won inflation credibility. Inflation expectations would also likely become significantly less stable, and risk premiums in asset markets--including inflation risk premiums--would rise. The combination of increased uncertainty for households and businesses, higher risk premiums in financial markets, and the potential for destabilizing movements in commodity and currency markets would likely overwhelm any benefits arising from this strategy. A first option for providing additional monetary accommodation, if necessary, is to expand the Federal Reserve's holdings of longer-term securities. As I noted earlier, the evidence suggests that the Fed's earlier program of purchases was effective in bringing down term premiums and lowering the costs of borrowing in a number of private credit markets. I regard the program (which was significantly expanded in March 2009) as having made an important contribution to the economic stabilization and recovery that began in the spring of 2009. Likewise, the FOMC's recent decision to stabilize the Federal Reserve's securities holdings should promote financial conditions supportive of recovery. [T]he FOMC will strongly resist deviations from price stability in the downward direction. Falling into deflation is not a significant risk for the United States at this time, but that is true in part because the public understands that the Federal Reserve will be vigilant and proactive in addressing significant further disinflation. It is worthwhile to note that, if deflation risks were to increase, the benefit-cost tradeoffs of some of our policy tools could become significantly more favorable. Second, regardless of the risks of deflation, the FOMC will do all that it can to ensure continuation of the economic recovery. Consistent with our mandate, the Federal Reserve is committed to promoting growth in employment and reducing resource slack more generally. Because a further significant weakening in the economic outlook would likely be associated with further disinflation, in the current environment there is little or no potential conflict between the goals of supporting growth and employment and of maintaining price stability. Although many of us think there is no need to wait and see if "further action should prove necessary" (e.g. Mark Thoma) the speech should be somewhat reassuring to those, like Paul Krugman, who argue the Fed is in denial (but he is not reassured). More reaction from Free Exchange and Calculated Risk. 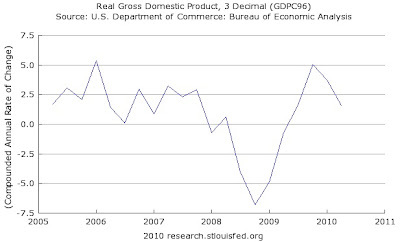 The BEA's second estimate revised the growth rate of real GDP in the second (April-June) quarter to 1.6%, down from the previous 2.4% "advance" estimate, and slower than the 3.7% growth rate in the first quarter. While still positive - i.e., consistent with a "recovery" - that growth rate isn't fast enough to keep unemployment from rising over time, i.e., its not recovery that feels like a recovery. Inventory "investment" was revised down, which means that businesses haven't accumulated as much stock as previously thought, so they would need to produce more to meet a given level of demand going forward. A revision upwards in imports. People are buying stuff: consumption spending was actually revised upwards slightly, but more of it was on foreign-made goods than previously thought. Calculated risk has a nice table comparing the advance to the second estimate. The third estimate is due September 30. Economics is the science of thinking in terms of models joined to the art of choosing models which are relevant to the contemporary world. That comes to my attention via David Colander, "The Death of Neoclassical Economics" (HT: Frances Woolley). As a general rule, whenever you hear special-interest groups using near-hysterical language to warn that some proposal will destroy jobs, snuff out innovation and end free-market capitalism as we know it, you can generally assume that progress is being made. The rest of his Washington Post column is about internet regulation. 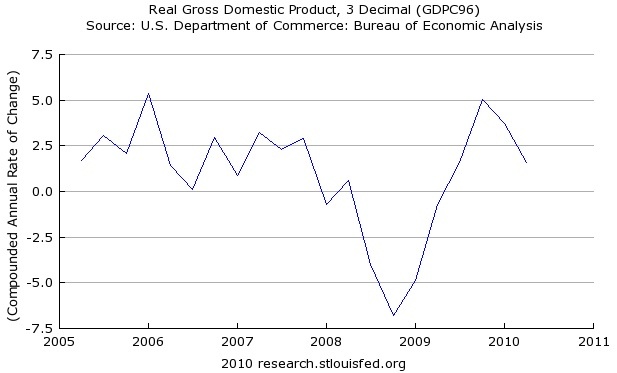 Krugman has more - including a link to Bernanke's paper - in this blog post. The Fed does seem to be overly-cautious, though its recent decision not to contract its balance sheet as planned is a baby step in the right direction. It could be worse: as new FT econ blogger Gavyn Davies explains, the Fed and Bank of England have been much more aggressive than the "hard currency mob" at the European Central Bank and (still) the Bank of Japan. According to the latest from the BLS, employment fell by 131,000 in July. Private-sector payrolls increased by 71,000, but the government shed 202,000 jobs (143,000 of which were temporary census workers). The unemployment rate held steady at 9.5%, mainly because labor force participation ticked downward again. The 48,000 decline in state and local government employment reminds us why the state aid bill that just passed the Senate is necessary (but insufficient!). The report also included a downward revision in June payrolls to a loss of 221,000 (from 125,000); the June gain in private-sector employment now stands at 31,000 (versus 83,000 originally estimated). As always, Economix has a good write-up; Calculated Risk has nice pictures, and RTE has a roundup of Wall Street reaction. On the politics, Ezra Klein asks "what is the White House thinking?" 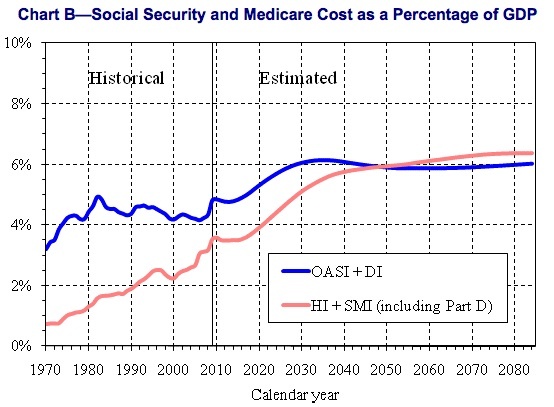 Summary of the Social Security and Medicare Trustees' annual report, 2010: The red line represents Medicare (HI: Hospital Insurance and SMI: Supplemental Medical Insurance) and the blue line is Social Security (OASI: Old Age and Survivors Insurance and DI: Disability Insurance). 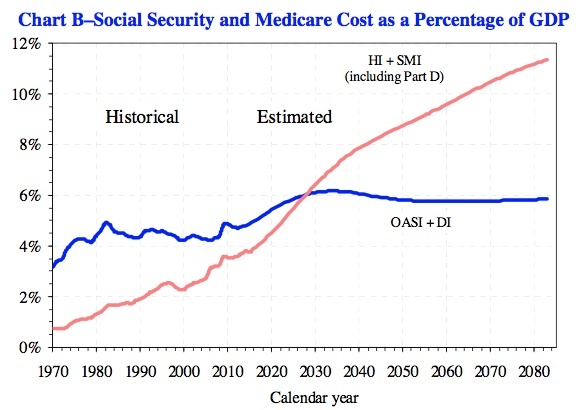 That's what President Obama and other reform advocates meant by "bending the curve." If it holds up over time, it represents a huge step towards improving the government's long-term financial picture - i.e., the health care reform bill was a tremendous act of "fiscal responsibility." 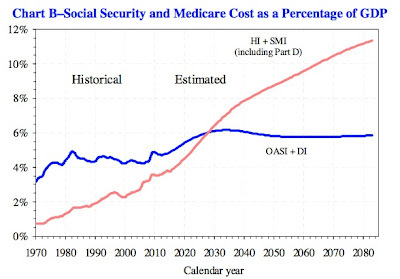 The other takeaway from the chart is that, in general, the fiscal situation of the main "entitlement" programs isn't nearly as dire as some would have you believe. 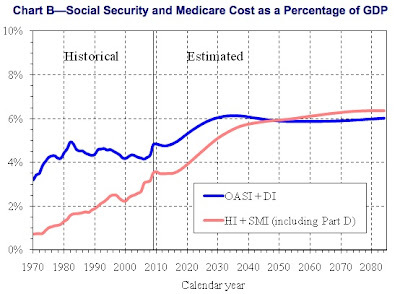 Social Security looks to level off at roughly 6% of GDP, which is quite manageable, and now, thanks to the reform, Medicare may do the same. Reimposing Depression-era constraints on banking would be the equivalent of setting a 25 mph speed limit on I-95. The accident rate would surely fall, but cost to commuters would be enormous. Our best hope of avoiding a recurrence of the financial turbulence of the last few years is an improved regulatory structure, which the Dodd-Frank legislation will deliver if the new regulators adopt sensible rules, combined with effective and sustainable macroeconomic policies.